← MINI-ME!! More FUNGAL morpho-deformities: Mushrooms get confused. 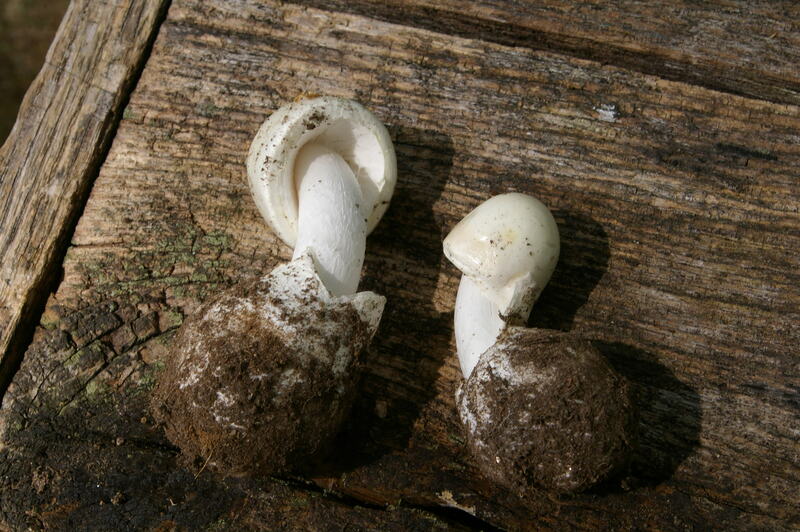 I touched on Rose-comb in the Mini-me blog and I thought I’d go back for another look at this oddity AND a bit more on geotropism, AKA gravitropism, because every active wild mushroom hunter will encounter these abnormalities sooner or later. When you first DO find one of these in the wild it’s a little bit of a WTF moment….? Everybody loves chickens not to mention eggs. Well almost everybody. Chickens, for a long time restricted to rural backwater backyards are moving up in the world….they’ve become something of a suburban fad lately and their fancy designer coops are popping up like mushrooms in tony neighborhoods coast to coast. Rooster’s have this fancy ornament atop their head called a comb. It looks for all the world like a punk rockers spike haircut and at least in part it serves the same purpose…to attract a mate. The other thing the comb does is it works as a cooling system when it gets hot. The chickens lose heat through the comb.There’s a bunch of different kinds of combs, at least nine, and one we’re interested in today is the Rose-comb. Below is “Puddin”, winner of a big time rose comb competition. Yup, chickens compete in all kinds of beauty contests. Puddin is damn handsome with that extra special rose comb don’t you think? It’s pretty fancy and it sits atop the chicken’s head a lot like a mushroom rose-comb sits atop a mushrooms’ cap. You knew we’d get around to mushrooms eventually. Here it comes…. So that’s the famous rose-comb champion Puddin and he brings us to the other rose-comb, the mushroom rose comb. These can be found in wild mushrooms, they’re not that uncommon, and they can also occur in commercial mushroom farms. They are the ENEMY of mushroom growers. Rose comb disease can wipe out a whole mushroom crop. 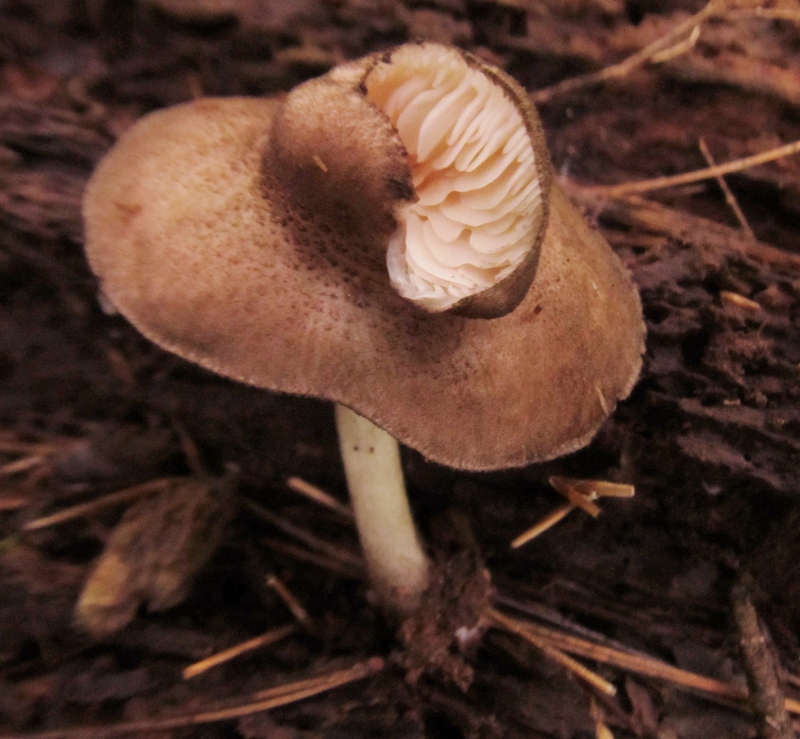 Environmental factors, specifically contact with petroleum products, triggers a genetic expression in the mushrooms that make gills grow upside down on the top of the normal cap. This ruins the crop for market no matter if your crop is buttons bound for the supermarket or Psilocybes bound for the black market. So growers take great care to eliminate petroleum product fumes from the growing environment. The same condition occurs in wild mushrooms and if you hunt fungi long enough you’ll find them. It’s fun to find them and usually perks up the conversation around the tables if you’re at a foray with other mushroom hunters. Here’s a wild mushroom rose comb. Kind of strange huh? I have a collection of these weirdos and they can occur on almost any mushroom including boletes, polypores and as seen here on gilled mushrooms.. The cause of this in wild populations isn’t completely understood but like the commercial cause it may be related to environmental factors affecting gene expression during development. Apparently what happens is something affects the developing mushrooms gravitropic response for a period and the mushroom produces gills upside down on the cap or in some cases sideways. In other words for a minute the mushroom forgets which way is up. 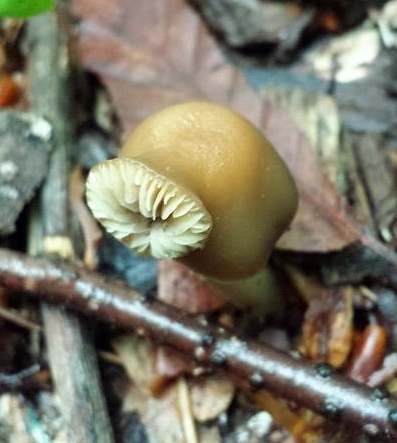 Below is a wild rose-comb on a Psilocybe mushroom with the gills on sideways. Photo by Michael Weese. Mutations are strange things in the popular concept but they are also the source of change and evolution. It’s all part of the big bargain of sexual reproduction. Sometimes the mutation is beneficial and helps the organism survive and sometimes it’s not so good. Sometimes the mutation hides in the genes and doesn’t get expressed unless some environmental factor triggers it. So it seems is the case with mushrooms. For all I know there may be a very detailed understanding of the genetics of how rose-comb arose in mushroom populations but I’m not aware of it if that research exists. There is however a good understanding of how rose-comb works in chickens and.In some breeds of chickens rose-comb is now a dominant hereditary feature. Keep in mind that domestic breeding of animals is just evolution ramped up to warp speed and guided by humans. So see if you can follow this explanation of rose-comb chickens in the chicken genome. “Rose-comb is caused by a 7.4 Mb inversion on chromosome 7 and a second rose-comb allele arose by an unequal crossing-over between a rose-comb and a wild type chromosome. The rose-comb phenotype is caused by the relocalization of the MNR2 homeodomain protein gene leading to a transient ectopic expression of MNR2 during comb development.” Got all that? Me neither. I don’t really speak “genetics” at that level but what the authors later tell me it means is that the rose-comb feature in chickens changed from being an occasional aberration (like rose-comb in mushrooms) to a regular expression of the phenotype by two simple consecutive mutations. Take another look at Puddin. Check out his rose-comb.. Two little changes in the chromosome and now he and all his offspring have that low hung double comb instead of one of the other eight comb styles. This is unlikely to happen with mushrooms though. One big group of mushrooms are called basidiomycetes. These are all the fungi that produce spores from club shaped cells called basidia. In a regular mushroom the basidia are on the surface of the gills. On polypore fungi the basidia are on the inside of the tubes under the fungus cap.In terms of reproductive success it pays for these mushrooms to have their gills or pores face downward so when the spores fall off the basidia they can get free of the parent mushroom, get caught in air currents down below and float away.. If you think about it, if mushrooms started regularly producing gills atop the cap, facing the sun and the moon, the spores would have nowhere to go because of gravity. Gravity would prevent the spores from ever achieving escape velocity to get up and away from the gills and into the air to float away and start a new colony. So with the basidiomycete mushrooms the spores only have enough energy leaving the gills to get far enough away from the gill to let gravity do the work of pulling them down toward the ground and then tiny air currents can carry them away to new territories. This is not true with other groups of mushrooms like the ascomycetes but that’s another story for another day. Which brings us back to gravity. As mushrooms grow they orientate their reproductive surface (gills,pores) downward toward the earth.I already visited this concept in the “Mini-Me” blog essay but I want to visit back once more for just a bit. The “Mini-Me” blog was about rose-comb AND gravitropism IN ONE MUSHROOM. That’s rare. Usually though you can go out in the woods and see examples of gravitropic growth responses all over. The tendency of mushrooms to grow either toward or away from the center of gravity (the Earth) is called gravitropism (also geotropism) and means, roughly, turning toward gravity. With mushrooms the gravitropic response is centered at the apex of the stem, where the stem joins the cap. In normal development the stem has negative gravitropism, which means that it grows away from gravity. The effect is that the gills always face downward so that when spores drop they can fall freely between the gills and get caught in the air column below the cap and float away. If for some reason the mushroom cap get twisted or loses its horizontal orientation metabolites in the cells “sense” this imbalance and the mushroom compensates by growing faster or slower (or both!) in order to recover the horizontal orientation of the gills (or pores). You can easily see how this works next time you find an Amanita mushroom. Pick it, bring it home and lay it on a flat surface. The Amanita will keep growing and in a few hours the stem will arch upwards trying to get the cap back to horizontal. 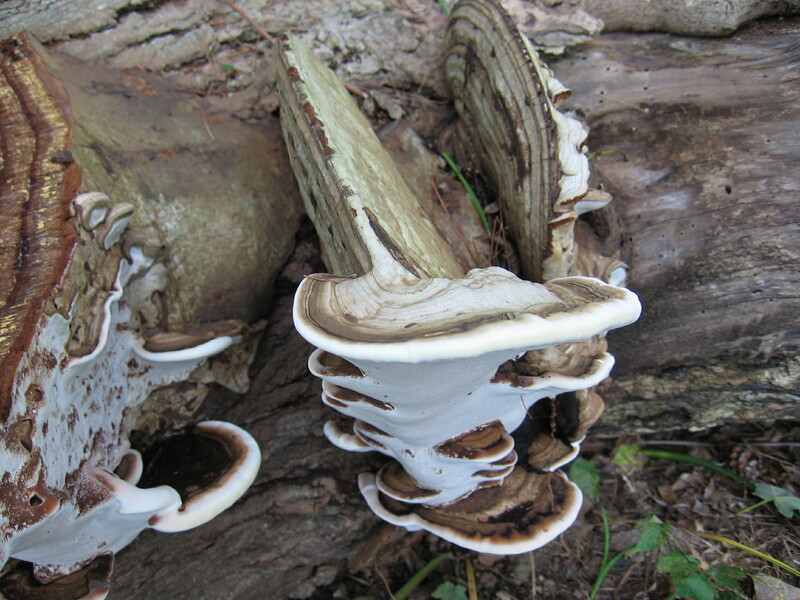 In the upper part of this photo the Artist Polypore was growing out of the side of a standing dead maple tree. There’s two of them and WHEN the tree was standing they were displaying regular fungal gravitropism. The fertile side of the fungus holding the pores, was pointing downward toward the earth. Then the tree fell over. Now the fungus had to reorientate 90 degrees to get the pores back in position for proper spore release. If the tree limb was moved again the polypore would re-position a third time and so on as long as the fungus stays alive and the host keeps moving. So mushrooms can tell stories. This fungus tells a story about the history and post mortem of this maple tree. And that is the main purpose of this blog. To tell stories. Mostly fungal tales but one thing leads to another and so…expect anything. NOTE++ If the subject of gravitropism interests you see FUNGI MAGIZNE Vol 5:4 Fall 2012 for Britt Bunyard’s article “Which Way Is UP” and excellent essay on gravitropism.